He’s everywhere, he’s everywhere. Scott Pickett reigns supreme in Northcote ? at Estelle Bistro and Estelle by Scott Pickett, he branched out into Smith Street and wowed them with St Crispin, and now he’s getting in on the ground floor ahead of a major renovation of the Queen Vic Market. Pickett’s Deli is the most relaxed installation yet. Part deli, part rotisserie, part wine bar ? it’s all communal dining or window seats inside, with the option of smaller tables outside on the busy streets of Elizabeth and Therry. It’s about popping in for an early morning breakfast or coffee, stopping by for a quick lunch, or lingering a little longer for an evening meal. At lunchtime you can order from the all-day menu as we did, but that meant I failed to look closely at the various blackboards around the interior and completely missed the glorious looking roast rolls and rotisserie chicken plates that were being devoured when I went to pay the bill. The chooks, free range from Milawa and Bannockburn, are cooked on a lovely looking stand up rotisserie. You can get them in a takeaway box with hand cut chips, fried to order and blessed with their own chicken and herb salt ? we’re talking crisped up fried chicken skin that is blitzed with with fine salt and herbs. Oh my, what did I miss!? On the menu proper, though, there’s still a fine selection of oysters and pickles, bar snacks, charcuterie and mains, all pretty shareable. Sardines on toast were certainly the prettiest dish. Fleshy fillets hidden underneath smoked tomato on crispy sourdough. 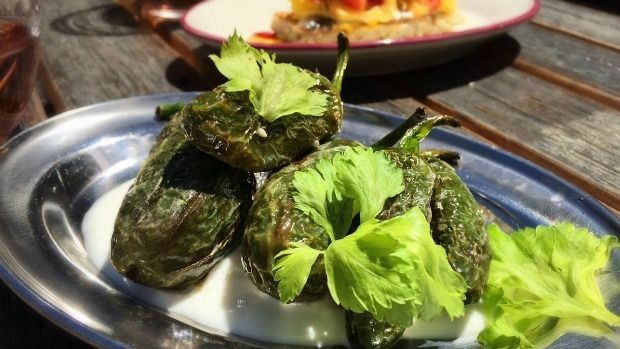 Padron peppers can disappoint me sometimes, given the excitement of the lotto (one in ten are supposed to be reeeeally hot) ? when they’re not, they’re kinda just peppers. These were saved by a tangy goats cheese sauce. I have to apologise to Ross and John, I went for raw meat again. 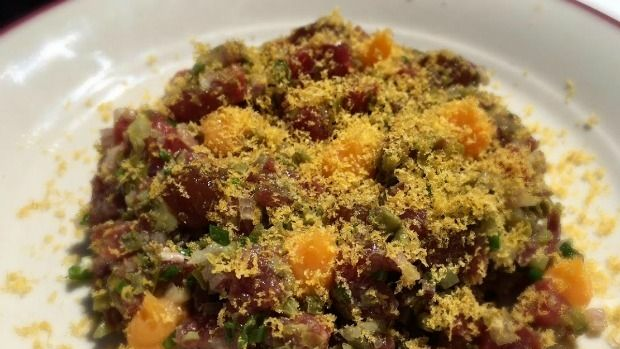 This tartare made from grass-fed Victorian beef, topped shaved bottarga, and dollops of confit egg yolk. Rather than potato crisps or toasts, Scott has gone for ‘pommes pailles’, super thin, crunchy shoestring potatoes. They’re on the side, so you can pick at them like we did, or mix them through the tartare mixture for extra crunch. The fish on the menu was a flounder, I wasn’t disappointed it was replaced by a John Dory fillet, I’m not generally rapt with the idea of whole fish and bones. It’s got to be a bonus for Scott being so close to the market and his fishmonger ? plenty of fresh fish around, even when the listed item is not. 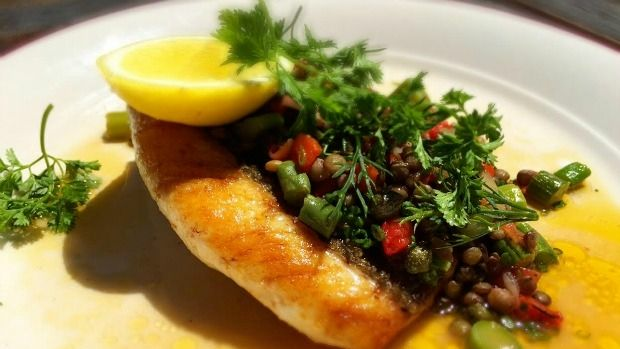 This was served simply, with a cheek of lemon, and some peppers, lentils, capers and herbs. Lovely. What a joy it must be for head chef Aaron Brodie to have some of Melbourne’s best produce on his doorstep, they’ll never want for fresh veg, fruit, meat and seafood ? and thus, neither shall we. To drink, there are 20 wines available by the glass, all chosen by ESP’s own sommelier, and a cold rose was perfect for a sunny Melbourne day. There’s a tight cocktail list, some quality Victorian and international beers and ciders, and handpicked spirits. Either the market will bring you to Pickett’s Deli, or Pickett’s deli might draw you back to the Queen Vic Market ? either way, you win.